I managed to get some alone time with Motorola’s latest Android offerings while attending the Digital Experience event at CES: The Droid 4 and the Droid RAZR MAXX. Both Droids feature dual-core processors and 8-megapixel cameras, and both can connect to Verizon’s LTE network. However, though similar, each phone brings something new to the Motorola Droid line on Verizon. The Droid 4 is the follow-up to the Droid 3, which launched on Verizon last July. You still get a roomy 4-inch display to fool around on, as well as a full slide-out QWERTY keyboard for faster typing. The keys felt as good as the ones on the Droid 3, if not slightly more comfortable. The keyboard is backlit, for easier typing in low light areas, and the keys are all slightly domed to assist in touch-typing. The front of the Motorola Droid 4. The thing that struck me most about the Droid 4 was how similar it looked to the Droid RAZR. 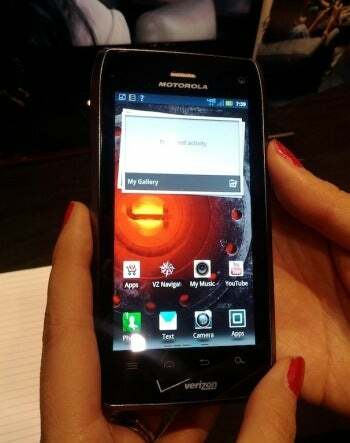 But, while the Droid 4 may look similar to the RAZR, it isn't nearly as sleek. The Droid 4 felt chunkier than the Droid 3, though its curved edges made it easy to hold. All the buttons on the phone were flush with the rest of the rest of the device, which makes it look good--but it also made the buttons a bit difficult to push. The Droid 4 runs Android 2.3 (Gingerbread), and it'll get an upgrade to Android 4.0 (Ice Cream Sandwich) in the first half of 2012. The phone comes with a custom Motorola overlay (which also comes with the RAZR MAXX), and the person I spoke with at the Motorola booth told me that the overlay would stay in place even after the phone gets updated to Ice Cream Sandwich. Inside the Droid 4 is a dual-core 1.2GHz processor (no word on whose chips are inside), and it has 1GB of RAM to help with multitasking. Apps like Let’s Golf and Madden NFL ran smoothly when I tried them, and the phone continued to perform well with several applications running at once. The Droid 4 has an 8-megapixel rear-facing camera, as well an 1.3-megapixel front-facing camera. The photos and videos I took with the Droid 4 came out grainy and with a noticible gray cast, which is disappointing considering how well the phone performed in other areas. The Droid 4 is compatible with the latest Motorola Lapdock accessories, though I didn’t notice any significant changes to the Webtop software that the phone runs while plugged in to the dock. The Droid RAZR MAXX has all the same features as the original Droid RAZR, save for a massive boost in battery capacity. Where the original Droid RAZR had a 1700mAh battery, the Droid RAZR MAXX packs a whooping 3300mAh, which makes it ideal for those of us that are constantly on our smartphones. Verizon claims that the Droid RAZR MAXX will offer a rather impressive 21 hours of continuous talk time. While I wasn’t able to test that out at the show, we’ll make sure to pay extra attention to battery life when we get a review unit in the coming weeks. Aside from the bigger battery, the Droid RAZR MAXX is identical to the RAZR we saw back in November. The phone is still super thin, and ran buttery smooth in my time with it. Both Droids will be available in the coming weeks, but no definite release date as of yet. There's been no word on pricing yet, but check back to PCWorld for more information as well as for full reviews for both phones. The Droid 4 is the phone to buy if you are looking for a physical keyboard, though the blurry display leaves some room for improvement.